Bonnie began her race in the 500 meter event of the 1988 Calgary Olympics immediately after her rival Christa Rothenburger of East Germany set a world record. Not to be outdone, Bonnie proceeded to skate the 500 meters faster than any woman had before or has since, capturing the gold medal in a world record time of 39.1. This record stood for 5 years until March 1994, when at the age of 30, Blair met her ultimate goal of shattering the 39 second mark with a time of 38.99. Four years later at the 1992 Albertville Olympics, with the world watching and a nation counting on her, Blair came through again. She blew away the field in the 500 meters, defeating her nearest competitor, Ye Qiaobo of China, by 18 hundredths of a second. The victory made Blair the first woman in Olympic history to win consecutive gold medals in the event, and the first American woman to win consecutive Winter Olympic gold medals. She made history again in the 1,000 meters, edging out Ye by just two hundredths of a second to win her second gold of the Games, and her fourth Olympic medal overall. In 1994, Blair skated in her final Winter Olympics in Lillehammer, Norway. Supported by 60 plus members of “The Blair Bunch”, Bonnie once again swept the sprint races winning gold medals in both the 500 and 1,000 meter events. 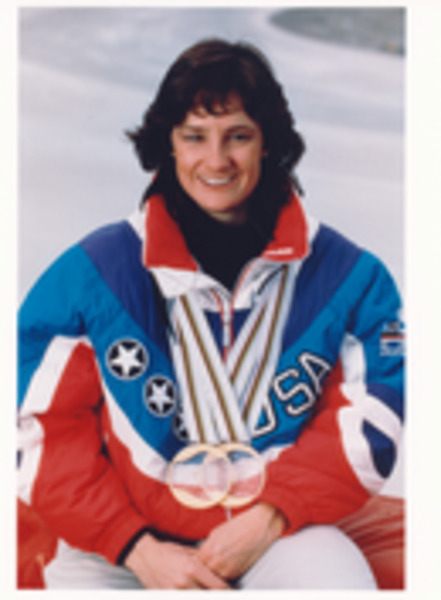 By capturing her sixth career Olympic medal, Bonnie emerged as U.S. history's most decorated Winter athlete, as well as the record holder for the most gold medals (5) won by an American woman in any sport. The United States Olympic Committee's Woman Speedskater of the Year from 1985 to 1992, Bonnie also captured the world record for overall points in the World Sprint Speed Skating Championships in 1989 by defeating defending champion and former Olympic opponent Christa Rothenburger of East Germany. She eclipsed that mark at a World Cup event in Davos in January 1992, shortly thereafter, in Calgary in April 1992, and finally again in Calgary in January, 1994. As if competitive skating wasn't enough to fill her agenda, Bonnie was a member of the 1989 Sundance Fruit Juicer Cycling Tour, on a team with 1988 Olympic bronze medalist cyclist Connie Paraskevin Young. In the spotlight as a novice, Bonnie displayed the potential to reach world-class level, placing high in several sprint competitions, and attracting media attention wherever she pedaled. Bonnie began skating when she was just two years old, following in the footsteps of her five older brothers and sisters. She also water skis, snow skis, and plays golf and softball.